San Antonio is the second largest town on the island of Ibiza, located in the Mediterranean Sea, and belonging to Spain. San Antonio Ferry Port is situated on the west coast, ten miles (16km) from the airport and the capital Ibiza. Ferries from San Antonio go to the ports of Denia, Barcelona and Valencia. The routes are run by Accionia Trasmediterranea and Balearia ferries, and using AFerry's simple booking form, you can find the right ferry for you. Below, you can find San Antonio ferry times, as well as our best deals. The Accionia Trasmediterranea fleet is modern and fast and they are designed so that the passenger finds the journey a part of his/her holiday. Onboard, there are swimming pools, spacious and luxurious cabins, bars, restaurants, cinemas, a disco, air conditioning and a spacious garage so you can take your own car. Balearia's fleet of ships is well-equipped, with many of their boats offering a range of cabin and seating options, a bar/cafeteria, restaurant, TV and shops selling perfume, cosmetics and confectionery. Both Acconia Trasmediterranea and Balearia offer great deals from San Antonio port, and you can take advantage of these by booking simply and securely with AFerry. The town itself is the largest and liveliest tourist resort on the island. Known as `San An' to the thousands of British clubbers who descend here each summer, the resort's proper name is Sant Antoni de Portmany. Its long, wide bay is lined with bars, restaurants and apartment blocks catering mainly for young British tourists. 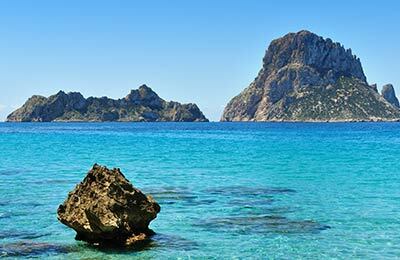 There are a few small sandy beaches in the resort, and the spectacular beaches of Cala Conta, Cala Bassa and Cala Tarida are a short ferry ride away. July and August are the best months to visit for those looking for buzzing nightlife, while the months of May and June, and September and October are most popular with families, couples and elder visitors. San Antonio is the second largest town on the island of Ibiza, located in the Mediterranean Sea, and belonging to Spain. 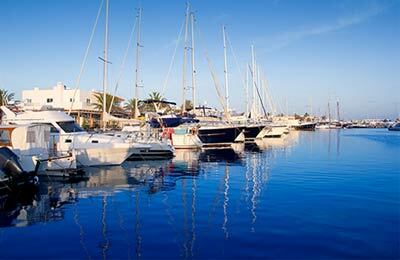 San Antonio Ferry Port is situated on the west coast, ten miles (16km) from the airport and the capital Ibiza. From San Antonio Ferry Port you can get a ferry to Denia, Valencia and Barcelona with the Spanish operator Balearia and to Valencia with ferry company Acciona Trasmediterranea. All ferries from San Antonio can be booked online through AFerry. San Antonio Ferry Port offers a full range of services and facilities. San Antonio Ferry port is easily reachable from anywhere in the island with the motorways C-731 and the PM-803.